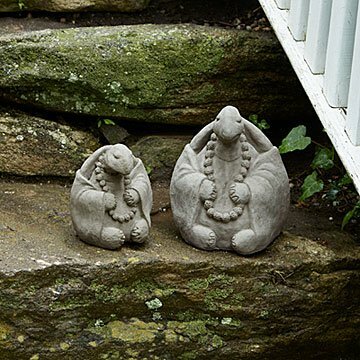 Add a calming presence to your outdoor space with this meditative turtle sculpture. Known for its slow-and-steady pace, the turtle adds a calming presence to outdoor spaces and reminds us to watch our speed and take in the little things in life. To add even more Zen-like charm, Chinese characters etched into the back of each turtle's robe represent the animal's primary characteristic—longevity. Michael's meditative sealed cement sculptures are designed to weather the elements through the four seasons as they center greenspaces with their amiable auras. Handmade in USA. Great small sculpture for our front porch. Turns lots of heads and gets smiles! The turtle is perfect! It will be so perfect for my friend serenity garden! My daughter thought that the blanket over the body and asian writing on the back were a nice touch. She loved it. I was extremely happy with the turtle as was my recipient. It was beautiful. The characters on the back made it very meaningful as well. It was the perfect gift for her. This was a gift. All I know is that my friend loves it. For cryin' out loud, let my submit my review. This was a gift for my niece. She lives in an apartment with a tiny patio. This was a whimsical item to put out among her plants. She loved it. Love it. Cute as can be. I love to find unique items for gifts. This was perfect. Small enough to be placed anywhere in the garden. Cute without being tacky.